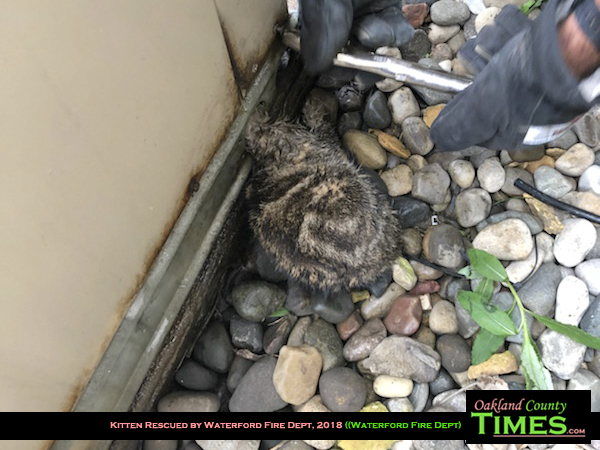 Waterford, Pontiac, MI– The Waterford Regional Fire Department responded to a call about a small kitten stuck in an air conditioning unit on Tuesday, May 22. The kitten had wedged itself into a tiny hole in the air conditioning unit, where her ear was stuck under a piece of metal. 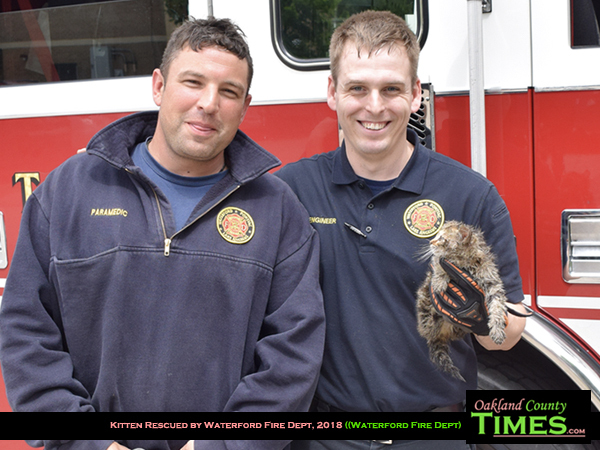 The crew tried several tools and tactics to free the kitten, including the jaws of life during the hour-long ordeal. 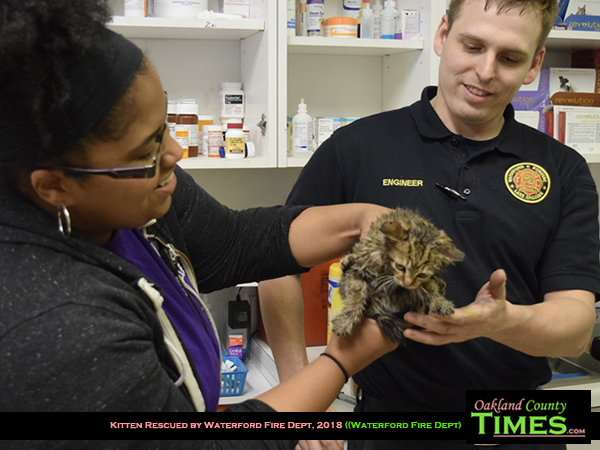 Once they finally pulled the kitten to safety, the fire department reached out to the Michigan Animal Rescue League (MARL) in Pontiac for help. “The kitten was scared and in shock when it arrived but thankfully our medical staff expects her to make a full recovery,” said Kim Pichler, Cat Care Coordinator at MARL. “She is about 8 weeks old and in need of medical care, good nutrition and lots of love and affection. That’s what we do best here at MARL,” Pichler added. 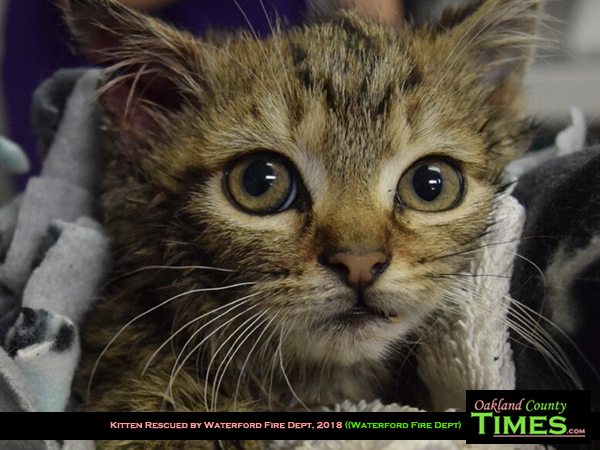 As the firefighters handed the kitten over to the MARL medical staff they agreed that Lucky would be a great name for this tiny girl. Lucky has had several baths to remove the oil that has soaked her fur. She spends the rest of her time wrapped in warm blankets and in the arms of the MARL staff. MARL expects her to be available for adoption once she is fully healed. “MARL provides care to over 1,200 animals a year and we are constantly faced with situations of cruelty and neglect,” said Magee Humes, MARL Executive Director. “We are extremely thankful to the Waterford Regional Fire Department for their heroic and compassionate actions. The fate of this kitten would not have looked been good without their life-saving efforts,” Humes added.